This is a special dinner in our house because we don’t make it often. Why? Well, because it’s not very healthy and it’s so good that we have a hard time not eating until we are overstuffed! That being said, it’s a great comfort food and every once in a while we all deserve a little spirit satiating food. What makes this recipe extra special is the caramelized onions. My husband is a specialist in making this tasty topping and it goes wonderfully with the alfredo sauce. Heat a well seasoned cast iron or nonstick skillet on medium-high to high. 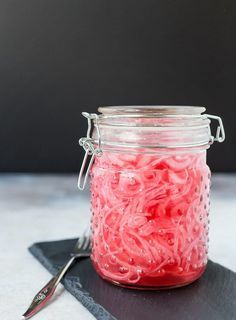 When hot add the sliced onions and about a 1/4 cup of water. Cook and stir until all the water is evaporated and then add 1/4 cup more of water. Continue the process until the onions are caramelized (about 10 min). When done, remove from heat, season it with salt and pepper then set aside. Bring a large pot of water to boil and add the fettuccine cooking as directed. In a separate pot, melt the butter on medium high heat. Add the garlic and saute until it begins to brown slightly. Add the wine and cream and bring to a slow boil. Simmer until the sauce reduces slightly (about 5-8 minutes). Whisk in the Pecorino Romano and Parmesan cheese and stir until it is melted and well incorporated. Because my husband likes a thicker sauce, we dissolve a couple of teaspoons of tapioca flour in a little wine and slowly add it to the sauce until we reach the consistency he likes. You can easily substitute your preferred thickening agent or simmer and reduce the sauce on the stove top to achieve the same result. Serve the sauce over the fettuccine topped with grilled chicken and caramelized onions.